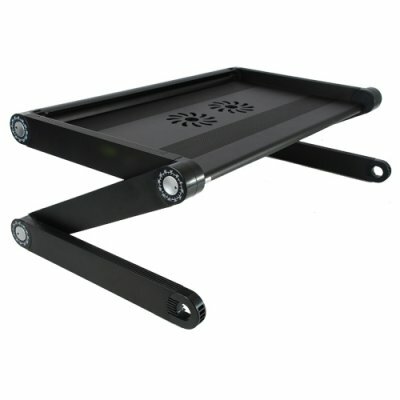 Successfully Added Portable Laptop Stand - Adjustable Laptop Desk (USB Cooling Fan) to your Shopping Cart. The perfect product for people who spend long hours in front of their laptop, notebook, or netbook computers! This oversized and deluxe adjustable and highly portable laptop stand will increase your comfort and productivity levels by at least two hundred percent! This isn't your average portable laptop desk. It's the KING of all laptop stands. WHY? It's got three joints that can be rotated 360 degrees and locked into place in 15 degree intervals! It has an extra large work surface, 44 centimeters to be exact, so you can easily fit your laptop, notebook, or netbook on it and still have room for an external mouse! It comes with two powerful fans to keep your laptop cool. The fans are USB powered. Plug it into an available USB port and prevent your notebook from overheating! If your work is important to you, then you owe it to yourself to get the CVFZ-G01, The King of Laptop Stands! Brought to you by the leader in online direct from China wholesale electronics and dropshipping - Chinavasion. It has 44 centimeters of workspace width! More poses than a Yoga Master! Quality wise, how would you rank the construction of this laptop stand, from 0-10, zero being an absolute waste of money? This is a 10. Buy it and watch your career take off! I think as a osteopath doctor that your Deluxe Notebook Work Station or portable Laptop Desk is fantastic for my patients who have neck and back pains and diseases,such as arthrosis and scoliotic deformation! !